With so many different septic system types, we answer a ton of questions each day, and it’s our pleasure to help our customers understand their systems. Here are the top 5 most common questions our customers ask us about their septic systems. 1. How often should I pump my tank? The recommended frequency for pumping your septic tank depends on several factors, including the number of people who contribute to adding waste to the septic tank, as well as the size of your tank. In short, the more occupants in your home, the faster solids accumulate in the tank, and the more often your tank should be cleaned. For a detailed explanation on how often you should pump your septic tank, click here. 2. How will I know it’s time to pump my tank? For a detailed explanation on how to know if it’s time to pump your septic tank, click here. 3. Should I use any additives? Septic additives are not a replacement for regular pumping. These are “quick fixes” don’t even slow the sludge accumulation in your tank. They can cause long-term damage when they are used in place of septic maintenance! For a detailed explanation on septic system additives, click here. 4. How is my septic tank cleaned? 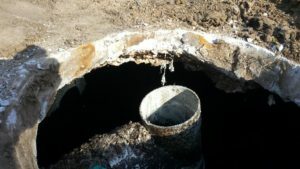 Each septic system maintenance provider has their own process of cleaning a septic tank, but here at Van Delden Wastewater Systems, we locate your tank, expose its lids, pump the tank, replace the lids, and provide you a detailed ticket of the work we completed and any issues we encountered. For a detailed explanation on how we clean septic tanks, click here. 5. Is my backup from my septic system? When your plumbing backs up and into your home, should you contact a plumber or a septic maintenance provider? There are a few places you can check to diagnose the problem and determine which professional to call. Check your septic system’s cleanout, the short PVC pipe with removable cap that sticks out of the ground between your house and the septic tank. If you don’t see any backup in that pipe, we recommend you call a plumber. If it does contain backup, the issue could be septic or plumbing-related. Check your septic tank’s liquid level. If it is normal, you should call a plumber; if overfull, contact a septic company. How old is your septic system? The older the system (average life of a septic system is 25 years), the higher chance it is a septic problem. For a detailed explanation on diagnosing septic system backups, click here. If you still have questions, please do not hesitate to call us! Our professional office team is ready to help.